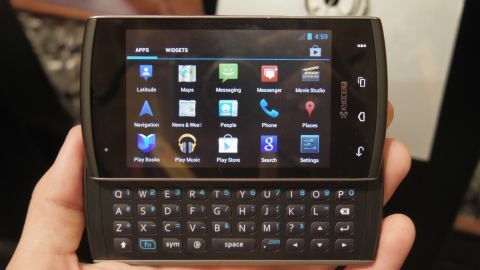 Kyocera unveiled two new handsets at CTIA 2012, and both will appeal to niche audiences. We covered the water-resistant Kyocera Hydro, but if water resistance isn't exactly your thing, there's also the Kyocera Rise. The Rise is a QWERTY keyboard phone with Ice Cream Sandwich. While those are obviously its main selling points, it has a long list of other features that will appeal to low to medium-level users. The 3.5-inch LCD display felt refreshingly quaint in our hands and kept the overall size of the chunky device somewhere between "chunky" and "decent." There's a rear-facing 3.2-megapixel camera which will suffice in need, but won't win you any "best of Instagram" awards. The keys are nicely spread and plenty responsive, but you'll definitely sacrifice a svelte frame for the added keyboard. The Kyocera Rise is set for a summer release, but little more is known - including which carriers it might appear on, various internal specs, and price. While we already know the Kyocera Rise isn't going to start any revolutions, we're always happy to welcome another QWERTY phone to the selective ranks.